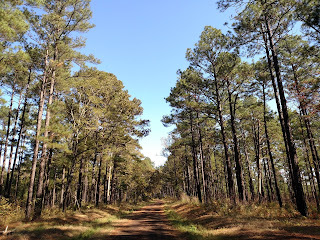 Longleaf forests once dominated the American south. 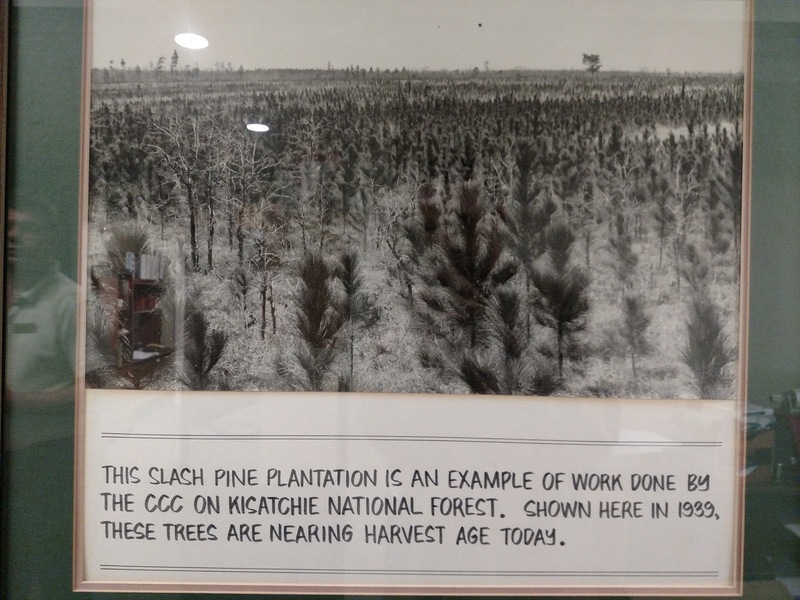 Early settlers noted these "tall, majestic" pines with a blanket of grasses and flowers beneath—a scenic vista with a "manicured park-like appearance." 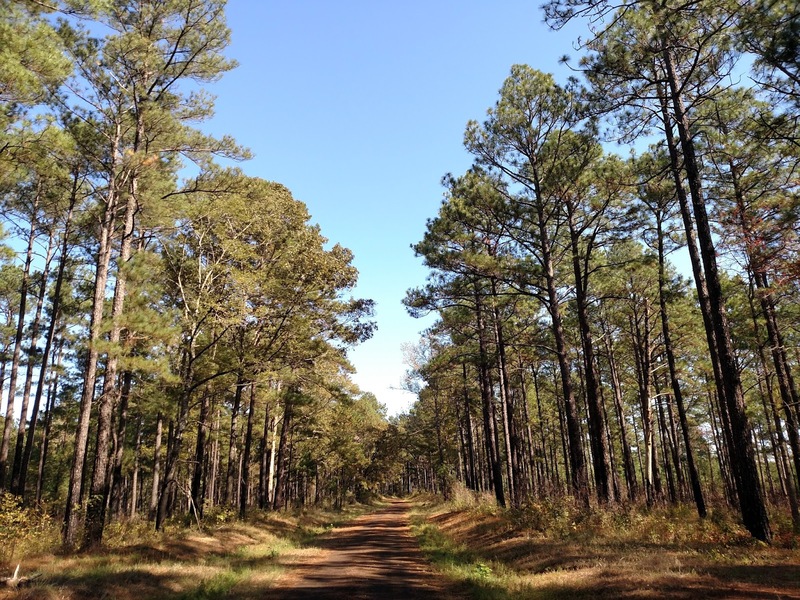 From southern Virginia to Florida to east Texas, these beautiful forests covered 140,000 square miles. Historically the region was mostly longleaf, while other southern pines (shortleaf, loblolly and slash) were sparse. Today, the reverse is true. Throughout the late 1800's and early 1900's, southern longleaf forests were almost entirely clearcut for their prized timber. Then other pines replaced them, namely loblolly, which regenerates faster and was widely favored for timber plantations. 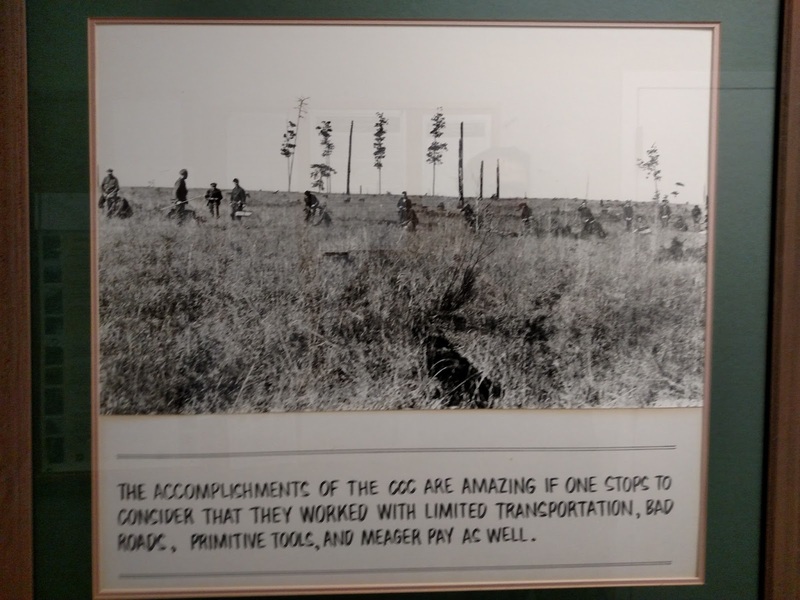 Even the Civilian Conservation Corps, tasked with reforesting vast areas in the 1930's, focused on loblolly or slash. Longleaf Forests became an endangered ecosystem. 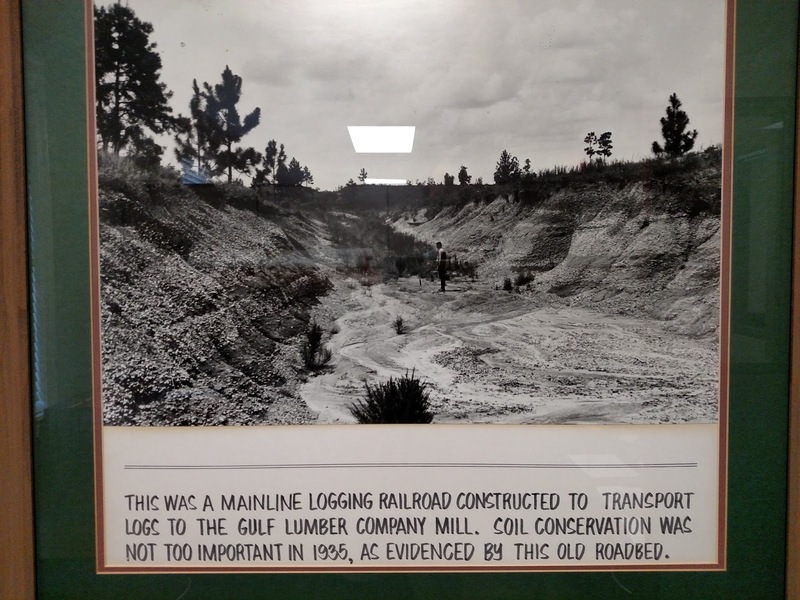 Below are historical photos courtesy of the Winn Ranger Station. Note the barren (clear-cut) landscape and the monocrop reforestation. Nowadays the importance of longleaf has been re-realized and the US Forest Service at Kisatchie National Forest is managing some portions of their 600,000 acres accordingly. 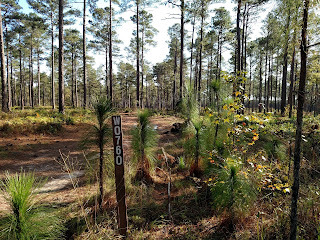 The Mendenhause Creek Project is one example of a longleaf restoration area. 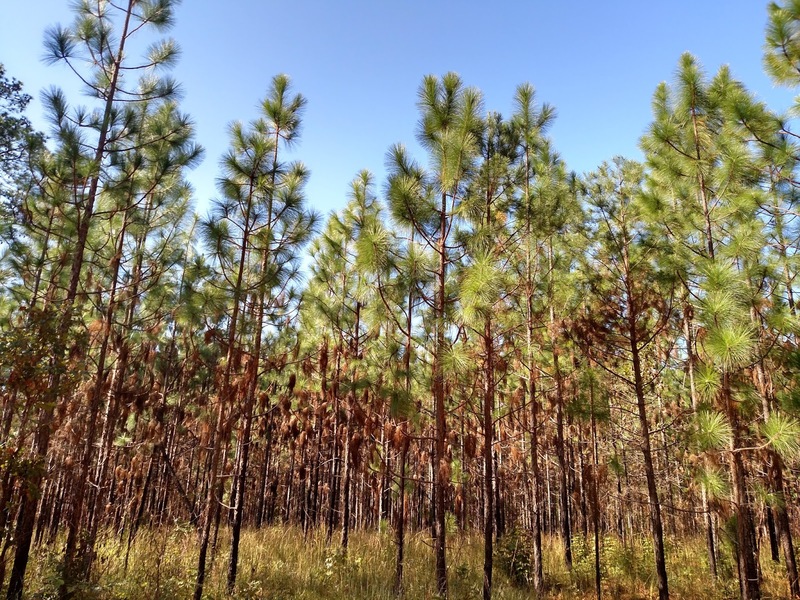 In the bigger picture, the America's Longleaf Restoration Initiative aims to increase longleaf acreage from 3.1 to 8.0 million in the next 15 years. 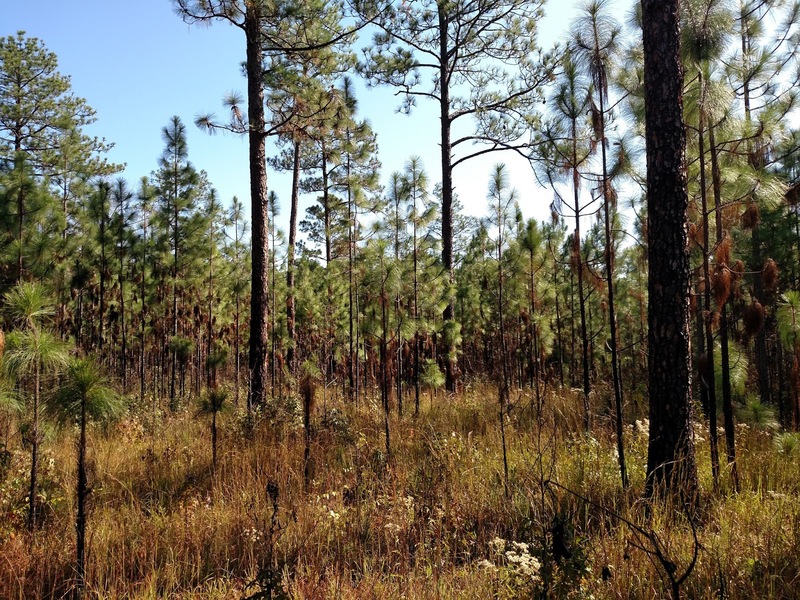 Why Restore Longleaf? It has many advantages over the faster-growing pines. Hardy – more resistant to storm, fire and ice damage. 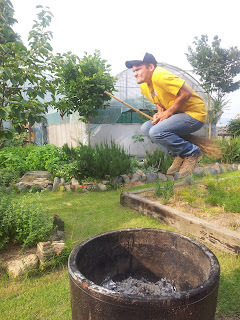 Habitat – Supports a diverse ecosystem of wildflowers, legumes and wildlife. 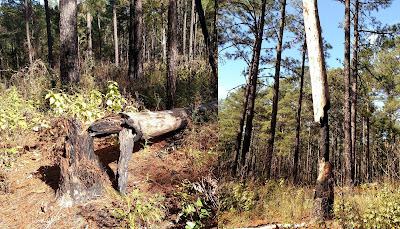 Loblolly vs Longleaf stands (mostly). Thinning to reduce forest density. Allows for control of species composition (i.e. 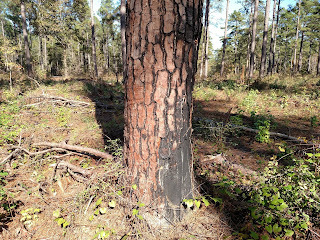 harvest loblolly, retain longleaf). Also generates timber revenues and biomass. Burning to reduce competition. 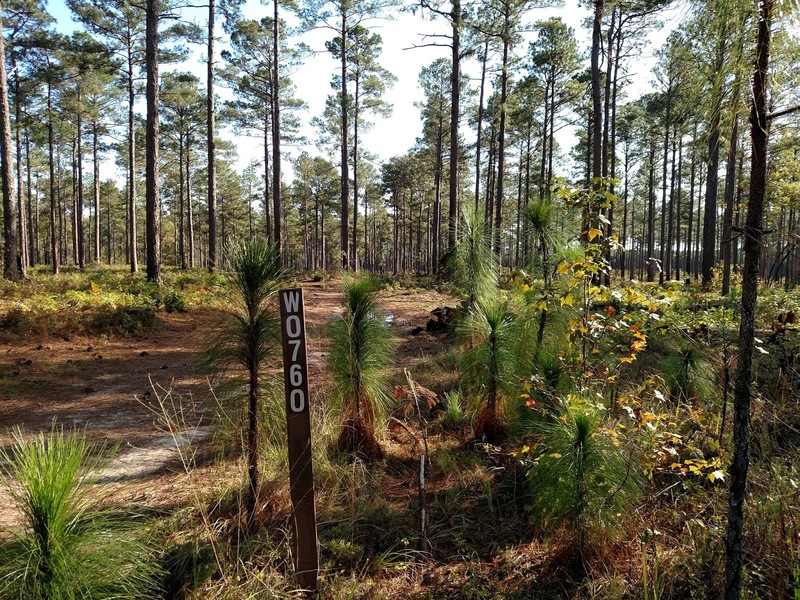 Allows slower-growing longleaf to establish by suppressing understory and faster-growing pines. In the absence of fire, competitive species creep up from the wet places where they've been conined.... As hardwoods muscle into the open spaces between the pines and up into the canopy, they outcompete the pines for root space... 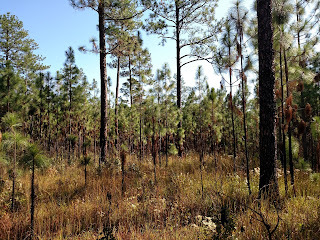 These deciduous forest conditions discourage the populations of gopher tortoises, Bachman's sparrows, red-cockaded woodpeckes, Florida scrub jays, and fox squirrels that could once make a living here... What was dominant for five thousand years because of fire essentially disappears without it. Longleaf regeneration can be promoted in cleared areas, either naturally if “seed trees” are present, or by planting seedlings at 622/acre or 7'x10' spacing. Propagating longleaf can be difficult. 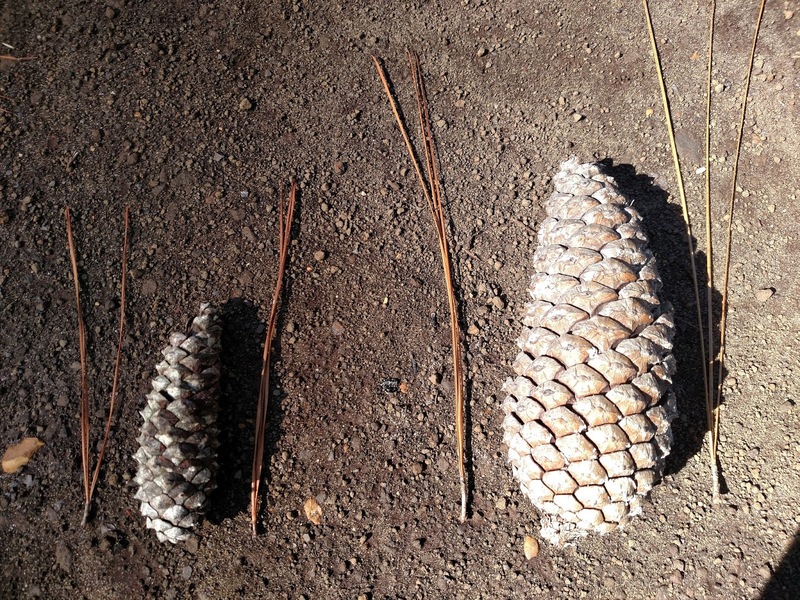 Compared to other pines, its seeds are infrequent and difficult to store and germinate, and it's susceptible to shock during transplant. Many earlier transplant efforts failed, according to George Weick, silviculturalist at the USFS. Nowadays containerized seedlings are more successful than the previous bareroot method, George explained. 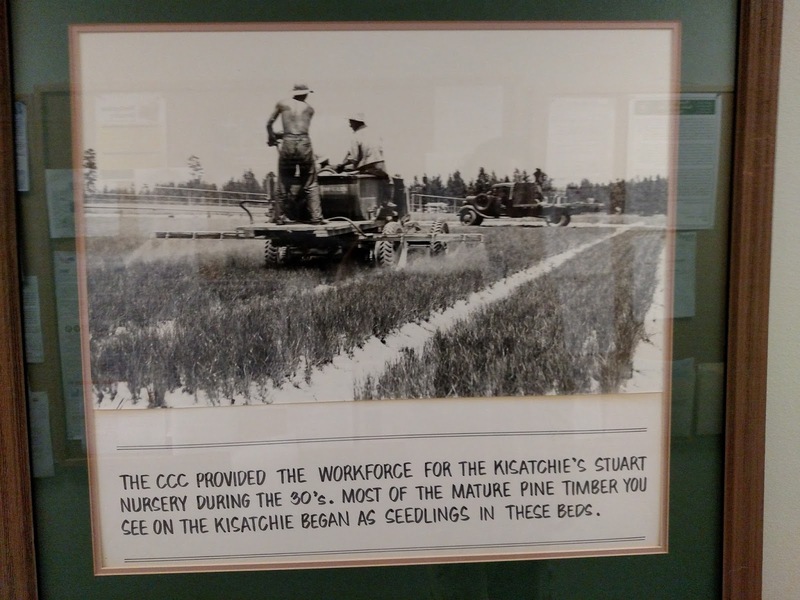 Also the process is now outsourced, with seeds gathered at the Stuart Orchard in Kisatchie, prepared and stored by a company in Georgia, then grown by a nursery company in Mississippi, before being shipped back to the USFS for transplant. Longleaf natural regen under seed trees. 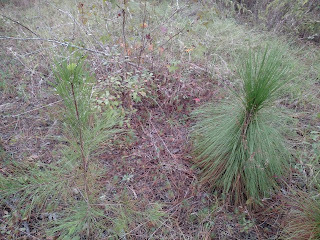 Longleaf natural regen along roadside openings. "even-aged regen," a.k.a. 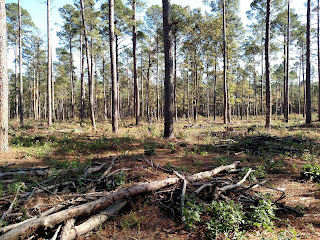 aftermath of clearcutting. 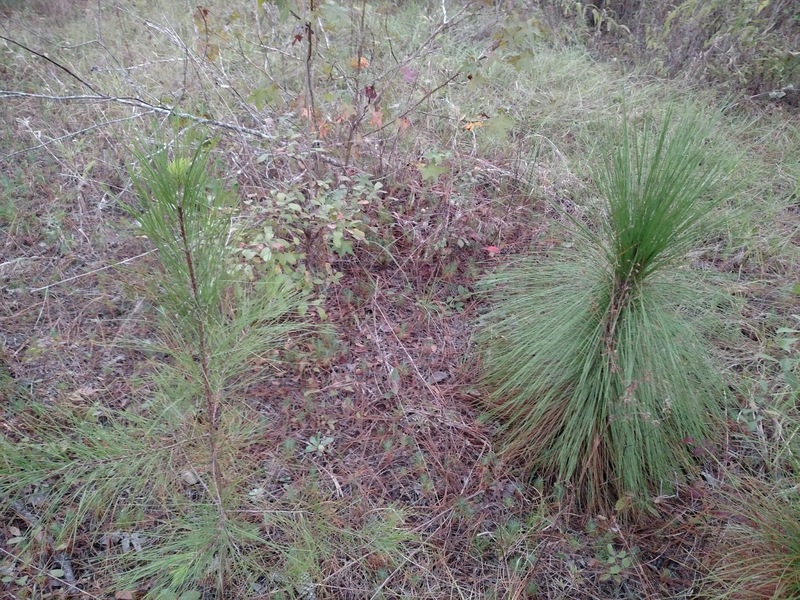 Longleaf seedlings planted near Stuart Seed Orchard. 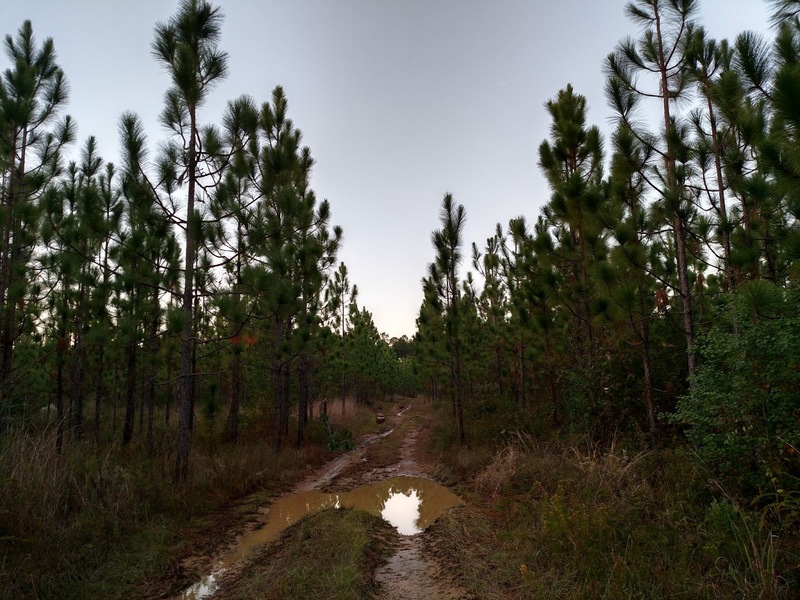 In related news, the NRCS pays private landowners to restore longleaf through the Wildlife Habitat Incentive Program (WHIP) and Environmental Quality Incentives Program (EQIP). 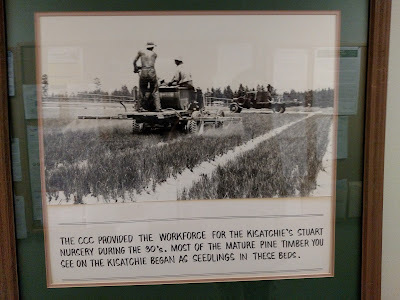 They pay roughly $30 and $20 per acre, respectively, covering the majority of maintenance costs (longleaf stands must be burned at year 6, 8, 10, 12 and 14 as opposed to loblolly only needing year 10 and 12), and making longleaf plantations nearly as profitable as loblolly. 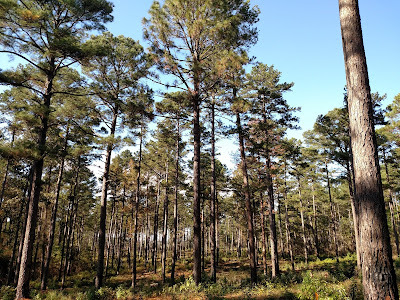 For another look at a longleaf restoration site, check out Compartment 112 at Sam Houston National Forest, or the Centennial Forest at Big Thicket National Preserve. 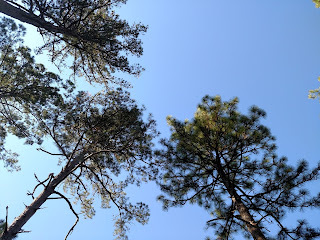 I'm pretty sure the Holly Ridge Gamelands in NC have Long Leaf pines. Thanks for the tip, hope to make it there sometime.